Pot = 6 cm, Branched Plant - Elegant, shrubby South African succulent with blueish ovate leaves. It thrives in Mediterranean climates and takes frosts to about -4 C. It is widely used in South African traditional medicine. 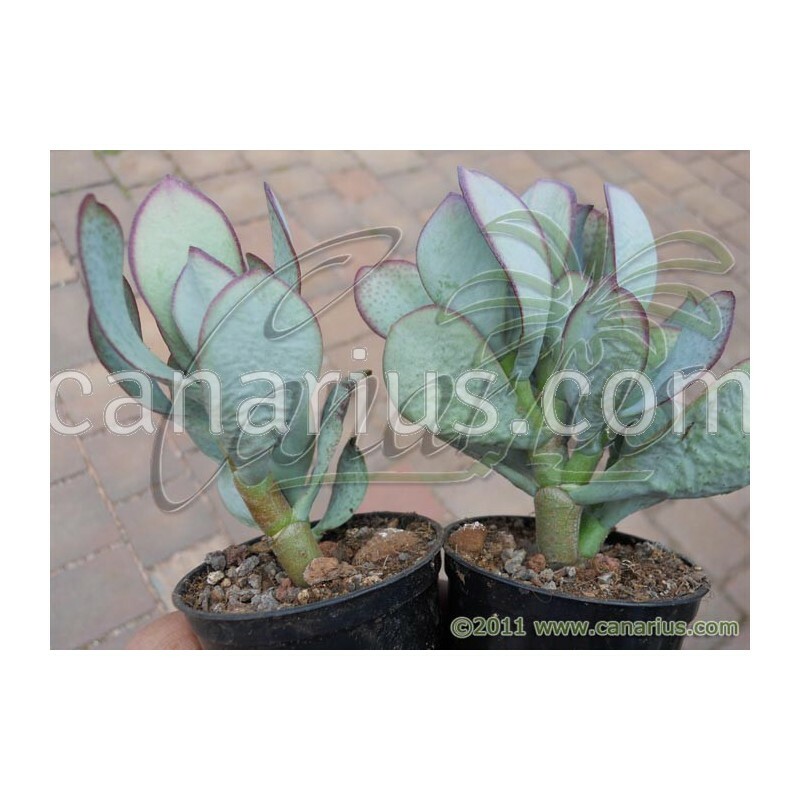 Elegant, South African succulent plant with blueish ovate leaves. It grows as a small shrub and blooms in Summer with orange-pink flowers held on tall stalks. The species Cotyledon orbiculata is a variable species growing wild in semi-dry areas of Angola, Namibia and South Africa. 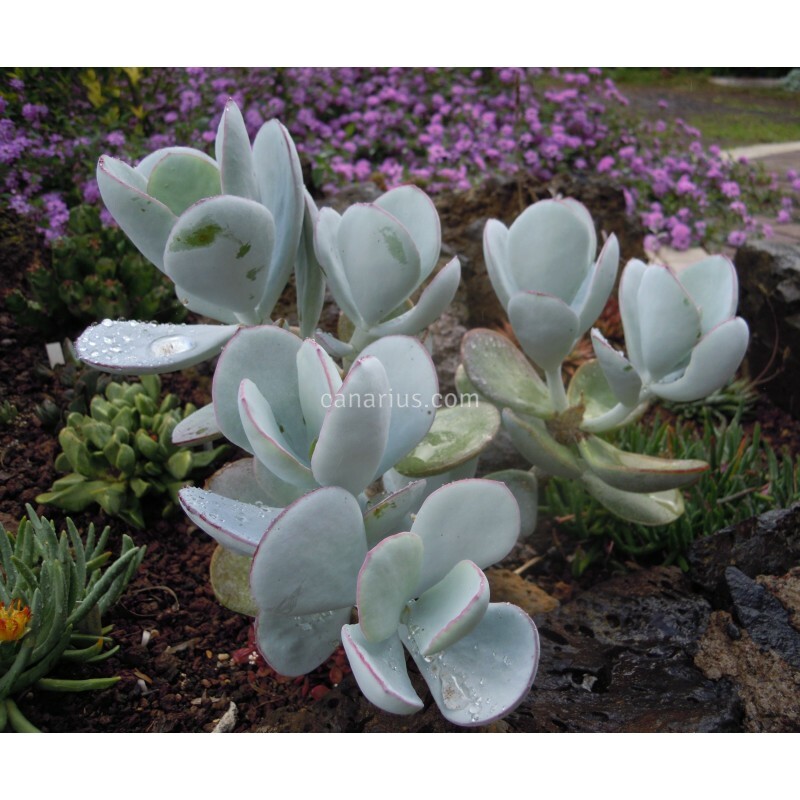 We offer the South African variety, Cotyledon orbiculata var. orbiculata, and that is usually found in sandy or stony soils with scrub vegetation. It is very easy to cultivate. It needs full sun in northern latitudes but can also grow in half shade in Mediterranean or Subtropical climates. It will eventually grow to 1 m in height but it can stay much smaller for years if kept in a small pot. It thrives in Mediterranean climates and takes light frosts. It is cold hardy to about-4 C, especially if kept dry. Besides its widespread use as a drougth tolerant ornamental plant, Cotyledon orbiculata is widely used in South African traditional medicine. They are grown, gathered and used for various infections, skin problems and epilepsia. Wild and cultivated plants synthetize many compounds, such as cardiotonic glicosides, saponines, tannins, hypoglycemic triterpenes and steroids. Be careful, not all useful plants are edible, some are toxic if eaten or applied to the skin. 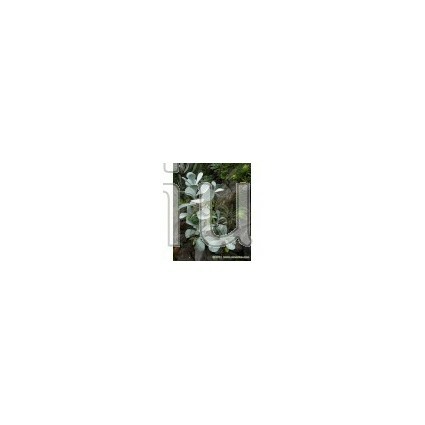 We offer a plant of the following size: Branched plant in Cont.= 6 cm. Container size will give you an idea, but depending on each case, some Crassulaceae are often sent bare root. These plants are very tolerant of bare-rooting.